Understanding your style preferences, your likes and dislikes. Perhaps you like a mid-century modern design but your husband prefers Martha Stewart Park Avenue. Knowing your preferences hones our thinking and lets us narrow the search so you have fewer choices to make. We can learn how to assist you. For many of our projects the process of design begins with helping our clients better understand what they like. That is why we can come armed with magazines, photos, and samples and encourage our clients to explore as we work together to determine their stylistic preferences. Understanding how you want to use your space. Perhaps Sunday afternoon is your time to bake and you’ve dreamed of a befitting Baker’s Kitchen adorned with Hafele Hardware to lift your heavy mixer. Just downstairs, your partner and ten friends raise the roof every third play and steel into your Zen-like kitchen to grab beers from the refrigerator. A good interior design should offer solutions to this like a retractable kitchen door to dampen sound and a wet bar with ample room for beer and ice. Understanding how you want to live is key to adapting your space to accommodate it. Understanding how you make your decisions. If choice is paralyzing, you may prefer fewer choices and strong recommendation from us. On the other hand, you may love making choices and only want our help in a supportive role. Either way, the key to successfully working together is to know how you like to work so we can tune into it. It’s also important to understand the dynamics of decision making – do you like to make decisions quickly? Are you and your partner joint decision makers? Understanding your process helps us tailor our process to you. Understanding your budget and the relationship between cost and getting the perfect choice..A dining room chandelier may cost $300 or $13,000. Our goal is to create a design that you can implement which means the design has to fit your budget. There may not be funds to accomplish everything you had hoped for but proper planning gives us the best chance to optimize the use of your funds. Understanding your priorities and schedule If you leave town every spring for two weeks of skiing that might be the perfect time to remodel the kitchen which means the time to start preparing is in the fall. Knowing your specific needs helps us plan to meet them with the smallest impact on your lifestyle. Do we match? Your home is a statement of who you are. The better we can understand one another, the better we can interpret your vision. Interior design requires a great deal of trust and the first meeting is your chance to determine whether the relationship feels right to you. A one hour initial consultation with our Designer is $100. This includes creating a proposal, itemizing your specific design goals and estimating the cost of your project. After our initial visit our designer will create a contract reflecting your projects objectives. Each item you requested will be listed with an estimate of the hours required to complete it. A range is given. A sum of the line items is provided to give an estimate of the total hours needed to complete your project. Ninety-percent of the time our actual hours for design fall within our estimate range. However, sometimes a client may determine what they like very quickly, spending fewer hours than anticipated. This will result in savings. Similarly, some clients grow very passionate about the design process as they understand it better and require more time and services. When projects take longer, they are billed more accordingly. Our designers will do everything to stay within the range and will tell you when you are heading beyond the contract range and guide you to complete the project within the estimate. It is not always possible nor is it always desired. Design work is one of the least expensive parts of a project, however, it has one the largest impacts. Less expensive materials when properly utilized as a result of good design will look better than more expensive materials in a poor design. The cost of design work often gives pause to our customers but they rarely regret the expenditure when they see the results. The contract is returned to you for your review at which point you may add or eliminate services. In fact, you may adjust the services at almost any time during the process as we work on an estimate basis. We are extremely flexible and top goals are keeping our clients 100% satisfied and creating stunning design that makes our clients happy everyday when they enjoy their beautiful homes. A complete set of floor plans. Specifications for all materials including flooring, tile, cabinetry, plumbing fixtures, lighting, all trim, and hardware. Post-design consultations with outside contractors when Stratagem Construction is not the general contractor. Additional construction management services by arrangement (to oversee outside general contractors). Too busy to do your own purchasing? It can be a lot of work. We can do your purchasing for you. Once the furnishings have arrived, we can set them up for you. We can install artwork and window treatments and arrange furnishings and decor. All you have to do is pick, approve, and give us a set of keys; we can do the rest. Our sister company, Stratagem Construction, can meet any construction need. With an in-house wood shop we can create custom built-ins or cabinets specifically designed for you. 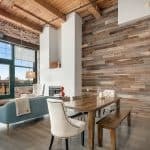 We do complete home renovations in Chicago including kitchen renovation, bathroom renovation, basement renovations, and complete cut rehabilitations. Stratagem provides carpentry, painting, flooring installation, custom closets construction, major heating and air conditioning, roofing, electrical and pluming services to our clients. Habitar can design the custom home of your dreams and Stratagem can build it with a commitment to quality and customer service that is unique in our industry. The cost structure of interior design is based on the amount of time needed to complete the design goals. In general, the more specific and complex the interior design needs, the longer they take to complete. For example, creating a contemporary entertainment-center takes less time than creating a similar built-in requiring a place for stereo equipment, a fold-out desk, office file cabinets, and additional storage. While the design work for a complete home renovation may take 2 to 3 months, construction can often begin before work is complete. We do our best to meet your needs and to give you a realistic idea of how long different parts of your project will take. Our staff includes a number of designers and their availability varies (though each and every one of them is excellent). You can work with whichever designer you choose, however, their availability will impact time frame for delivering the work. Small projects can often be delivered in several days or several weeks. More complicated project may take one or more months. Note: Fixed fees are applicable for projects with a clearly defined scope.